The team, which compiled data on more than 4,800 fatal landslides during the 13-year period, also revealed for the first time that landslides resulting from human activity have increased over time. The research is published today (23 August 2018) in the European Geosciences Union journal Natural Hazards and Earth System Sciences. The team found that more than 700 fatal landslides that occurred between 2004 and 2016 had a human fingerprint. Construction works, legal and illegal mining, as well as the unregulated cutting of hills (carving out land on a slope) caused most of the human-induced landslides. The number one country is India, which accounts for 20 per cent of these events. It is also the country where human-triggered fatal landslides are increasing at the highest rate, followed by Pakistan, Myanmar and the Philippines. Professor Dave Petley, Vice-President for Research and Innovation at the University of Sheffield, started collecting data on fatal landslides after realising that many databases on natural disasters were “significantly underestimating the extent of landslide impact”. While earthquakes and storms are deadlier, landslides cause a significant number of fatalities. The researchers identified a total of 4,800 fatal landslides, excluding those triggered by earthquakes, that occurred around the world between 2004 and 2016 and caused a total of about 56,000 deaths. The most tragic event identified by the researchers was the Kedarnath landslide in June 2013 in India, which resulted in over 5,000 deaths. It was due to extreme weather conditions that caused flash floods and massive mudflows, which affected thousands of religious pilgrims trapped in a mountain area. Since 2004, Professor Petley has painstakingly collected data on fatal landslides from online English-language media reports. To confirm the news stories were accurate, Professor Petley – and more recently Dr Froude, who reviewed all landslide accounts – checked each report whenever possible against government and aid agency articles, academic studies or through personal communication. Details about the landslides, such as location, impacts or cause, were added to their Global Fatal Landslide Database. Professor Petley said: “Collecting these reports and organising them into a database shows us where landslides are frequently harming people, what causes these landslides and whether there are patterns in fatal landslide occurrence over time. Aside from Asia, where 75 per cent of landslides in the database occurred, the areas most affected are in Central and South America, the Caribbean islands, and in East Africa. In Europe, the Alps is the region with the most fatal landslides. In support of past studies, the researchers also found that 79 per cent of landslides in their database were triggered by rainfall. Most events happen during the northern hemisphere summer, when cyclones, hurricanes and typhoons are more frequent and the monsoon season brings heavy rains to parts of Asia. The Natural Hazards and Earth System Sciences study highlights that fatal landslides are more common in settlements, along roads, and at sites rich in precious resources. They occur more frequently in poor countries and affect poor people disproportionately, the researchers say. In the Himalayan mountain region, especially in Nepal and India, many of the fatal landslides triggered by construction occurred on road construction sites in rural areas, while in China many happened in urban building sites. She added: “Landslides triggered by hill cutting are mostly a problem in rural areas, where many people illegally collect material from hillslopes to build their houses. “We found several incidences of children being caught-up in slides triggered as they collected coloured clay from hillslopes, for decoration of houses during religious festivals in Nepal. Educating communities who undertake this practise on how to do it safely, will save lives. The University of Sheffield’s Department of Geography has an internationally-recognised record of academic research by staff with wide-ranging interests in both human and physical geography. Geography at Sheffield is ranked within the top 15 UK departments following the results of the 2014 Research Excellence Framework. The impact of all its research has been ranked as world-leading or internationally excellent, according to the REF 2014. Sheffield is a multi-campus university predominantly over two campus areas: the Western Bank and the St George’s. The university is organised into five academic faculties composed of multiple departments. It had 20,005 undergraduate and 8,710 postgraduate students in 2016/17. The annual income of the institution for 2016–17 was £623.6 million of which £155.9 million was from research grants and contracts, with an expenditure of £633.0 million. Sheffield ranks among the top 10 of UK universities for research grant funding. Sheffield was placed 75th worldwide according to QS World University Rankings and 104th worldwide according to Times Higher Education World University Rankings. It was ranked 12th in the UK amongst multi-faculty institutions for the quality (GPA) of its research and for its Research Power in the 2014 Research Excellence Framework. In 2011, Sheffield was named ‘University of the Year’ in the Times Higher Education awards. The Times Higher Education Student Experience Survey 2014 ranked the University of Sheffield 1st for student experience, social life, university facilities and accommodation, among other categories. It is one of the original red brick universities, a member of the Russell Group of research-intensive universities, the Worldwide Universities Network, the N8 Group of the eight most research intensive universities in Northern England and the White Rose University Consortium. There are eight Nobel laureates affiliated with Sheffield and six of them are the alumni or former long-term staffs of the university. A revolutionary microscope that has produced images in the highest resolution ever obtained has been developed by researchers using microscopic techniques pioneered by scientists at the University of Sheffield. The record-breaking electron microscope, built by researchers at Cornell University in the USA, can produce images at a higher resolution than conventional approaches. It could be used to determine the atomic structure of materials that are normally damaged using existing methods. The microscope may eventually allow researchers to study 2D materials, such graphene, using unprecedented precision to provide new insights into this burgeoning class of useful materials that have extraordinary physical and electrical properties, and which could revolutionise many modern technologies. It may also lead to the development of a method that can image individual atoms in 3D objects without damaging the structure by using ‘slow’ low-energy electrons. Electron imaging is usually conducted using expensive lenses and high-energy electrons that damage many types of material. Alternatively, the Cornell research team recorded electrons that had been scattered through high angles to get around these problems. Once scattered, the electrons don’t look anything like an image, so the Cornell research team used computational algorithms developed by scientists at the University of Sheffield to work out backwards what the specimen looked like. This is what enabled the microscope to generate the record-breaking high resolution image. For many years, this backwards calculation, known as the phase problem, was regarded as impossible to solve for a large image. “The electron microscope developed by the Cornell research team is the most powerful microscope we’ve ever seen. It is capable of capturing images that have an unprecedented level of detail, which is important because it now paves the way for us to develop new insights into material structure at the atomic scale. 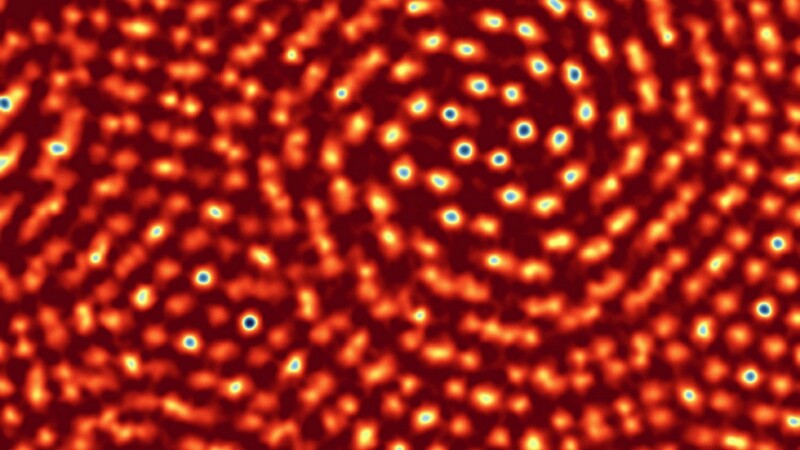 In a recent research paper published in Nature, a group led by physics professors David Muller and Sol Gruner claimed a world record for electron microscope resolution using a high-powered detector and a technique called ptychography. Their technique was shown to measure down to 0.39 ångströms or 0.039 nanometers (one-billionth of a meter). Guinness World Records has officially recognized the Cornell collaboration’s achievement, listing it alongside such notables as Robert Pershing Wadlow (at 8 feet, 11.1 inches, the world’s tallest human) and Lee Redmond (longest fingernails, with a combined length of 28 feet, 4 inches). Gruner, former director of the Cornell High Energy Synchrotron Source, said he’d always dreamed of making the Guinness grade, but didn’t figure microscopy would be his ticket to fame. That brings to four the number of current Cornell University-affiliated record-holders. Muller also shares the record for thinnest glass (three atoms thick, 2013); the other records are held in part by applied and engineering physics professor Harold Craighead, who shares records for smallest replica guitar (1997) and lightest object weighed (2004). In addition, the current record for furthest distance covered by a quadruped robot (83.28 miles, in 2015) eclipsed the mark of 40.5 miles set by Cornell’s Ranger robot in 2011. See the full Sheffield article here . See the full Cornell Chronicle article here . Depiction of the tidal disruption event in F01004-2237. 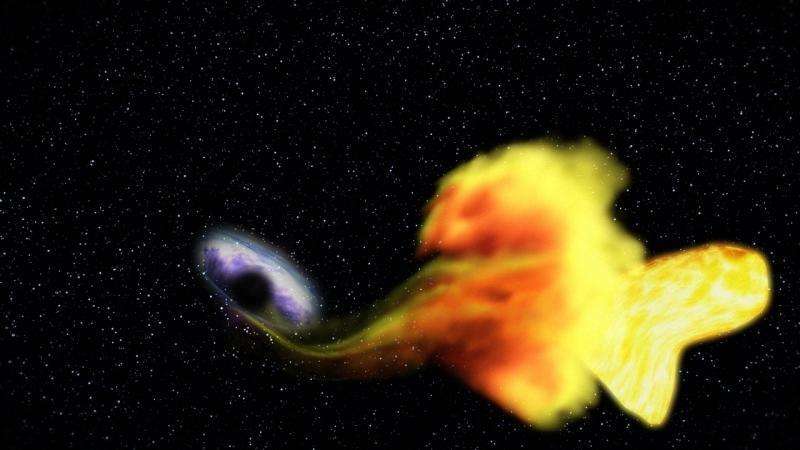 The release of gravitational energy as the debris of the star is accreted by the black hole leads to a flare in the optical light of the galaxy. Credit and copyright: Mark Garlick. The study, published today (27 February 2017) in the journal Nature: Astronomy, was supported by a grant from the UK Science and Technology Facilities Council. The findings were based on observations made with the William Herschel Telescope, which is operated on the island of La Palma by the Isaac Newton Group in the Spanish Observatorio del Roque de los Muchachos of the Instituto de Astrofisica de Canaria. The study also used data taken with NASA/ESA Hubble Space Telescope, and the Catalina Sky Survey. Scientists at the University of Sheffield’s Department of Physics and Astronomy are exploring the fundamental laws of the universe and developing pioneering technologies. Students in the Department work with leading academics in the field to look beyond our planet to tackle global challenges – from climate change to meeting energy demands. This research further cements the University’s position at the forefront of Physics and Astronomy research. The University of Sheffield (informally Sheffield University is a public research university in Sheffield, South Yorkshire, England. It received its royal charter in 1905 as successor to the University College of Sheffield, which was established in 1897 by the merger of Sheffield Medical School (founded in 1828), Firth College (1879) and Sheffield Technical School (1884). Sheffield is a multi-campus university predominantly over two campus areas: the Western Bank and the St George’s. The university is organised into five academic faculties composed of multiple departments. It had 19,555 undergraduate and 8,370 postgraduate students in 2015/16 and its total and research income came to £635.7 million and £168.5 million in 2015/16 respectively, which made Sheffield among the top 10 of the UK universities in terms of Net assets. Sheffield was placed 84th worldwide by The QS World University Rankings 2016. In 2011, Sheffield was named ‘University of the Year’ in the Times Higher Education awards. The Times Higher Education Student Experience Survey 2014 ranked the University of Sheffield 1st for student experience, social life, university facilities and accommodation, among other categories. It is one of the original red brick universities, a member of the Russell Group of research-intensive universities, the Worldwide Universities Network, the N8 Group of the eight most research intensive universities in Northern England and the White Rose University Consortium. There are seven Nobel Prize laureates amongst Sheffield academics, six of which are its alumni or former staff.